Outback Queensland is a great place to visit. Many travellers spend all their time on the coast of Queensland, enjoying cities, beaches and coral reef, and miss out the most unique place - the outback. It’s harsh and empty, too hot during the summer and too cold during the winter, but it's so much fun to travel in the outback in Australia. While every state in Australia has at least a bit of the outback, the outback in Queensland is reasonably accessible compared to the other states of Queensland's size, and you can do a lot of it without even needing to drive a four wheel drive vehicle. Some of the bigger towns in the southernmost Queensland are Warwick, Stanthorpe, Goondiwindi, St George, Dirranbandi, Bollon and Cunnamulla. South west of Brisbane, Warwick is Queensland's second oldest town after Brisbane. It has got some historical buildings as well as the Pringle Cottage and Museum. Places to stay include Comfort Inn, Coachman's Inn, McNevin's Gunyah Motel, and City View Motel. South of Warwick is Stanthorpe that has a museum and art gallery, and places to stay include Alure Villas, Apple Blossom Cottage, Granite Court Motel, Happy Valley Retreat Hotel and Sommerville Valley Tourist Park and Resort. South of Stanthorpe is the Granite Belt - the only wine region in Queensland that produces wine from grapes (the northern ones are tropical fruit wineries). 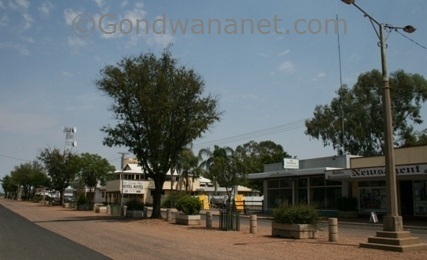 Further west is Goondiwindi - the centre of the surrounding cotton farming country. There are a few old pubs, a museum, and the MacInture Cotton Gin where you can take a tour between April and July. Places to stay include Boggabilla Motel, Comfort Inn, Country Roads Motor Inn, Goondiwindi Motel and the Town House Sundowner. West of Goondiwindi is St George - another cotton centre, otherwise famous for its floods. South of St George is the little Dirranbandi, and further west are Bollon and Cunnamulla. Inland from Brisbane are Ipswich, Toowoomba, Dalby, Miles, Roma, Mitchell, Morven, Augathella, Charleville, Quilpie, Stonehenge, Jundah, Windorah, Bedourie, Birdsville. Ipswich is nowadays almost a suburb of Brisbane and there is not much for travellers. Places to stay include Best Western Motor Inn, Country Comfort Hotel, Metro Hotel and Quest Apartments. Toowoomba has grown to a sizeable town with some nice old buildings, parks, Botanic Gardens, Cobb&Co Museum and a regional art gallery - however it's most famous for the 2010-11 Queensland Floods when the news reported an "inland tsunami" flood the town and kill 35 people. Places to stay include BIG4 Toowoomba Garden City Holiday Park, Comfort Inn Glenfield, City Motor Inn, Country Gardens Motor Inn, Burke and Wills Hotel, Country Comfort Toowoomba, Central Plaza Apartments, Sunray Motor Inn, The Coachman Motel, Tudor Lodge Motel and Toowoomba Motel. Dalby is another town that gets floods, and other than a museum there is nothing much for travellers. Places to stay include Dalby Fairway Motor Inn, Dalby Midtown Motor Inn and Motel Myall Dalby. Inland from Dalby is Miles, and a great place to visit in town is the Miles Historical Village. A place to stay is Starline Motor Inn. West from Miles is Roma, and the thing to see in town is the Big Rig Complex - a museum of the exploration of oil and gas, which are found in the area. Places to stay include Roma Explorers Inn and Motel Carnarvon. West of Roma are the small towns Mitchell and Morven, and west from there is Charleville, another town known for floods. The main thing to see is the Skywatch Observatory, where you can watch an informative movie, use telescopes night time, and listen to a guided tour about meteorites and other interesting stuff. There is also a historic House Museum, Royal Flying Doctors Service, and the School of the Air. A place to stay is Charleville Motel. 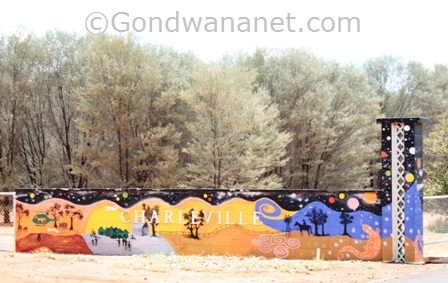 North of Charleville is Augathella - a small outback town with some colourful murals. After Charleville, the places get more remote. The next town west is Quilpie - an opal mining town with a museum where you can watch opal cutting demonstrations. Further inland are Stonehenge, Jundah and Windorah - all small outback towns in the middle of some flat open country, a lot of goanna lizards, and some very red sand dunes. Places to stay are hotels (pubs) and camping grounds. 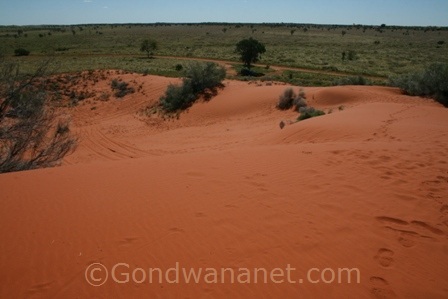 Further west are Bedourie and Birdsville in the south western corner of Queensland in the so-called Channel Country. Bedourie is the administrative centre of the Diamantina shire, and there is nothing especially for visitors except a good old pub. Birdsville has more for visitors. 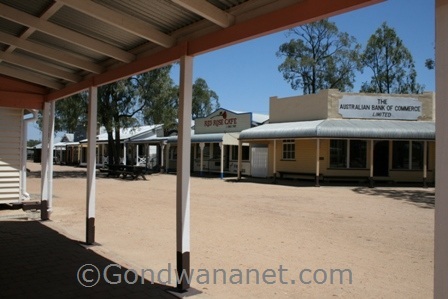 There is a museum in town, as well as the famous Birdsville Pub. 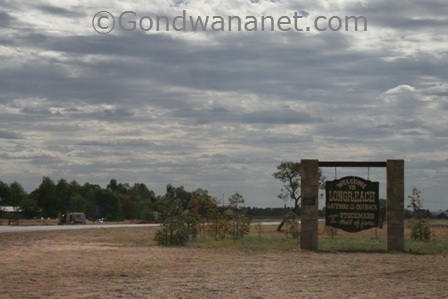 In the first weekend in September, the famous Birdsville Races are held here. You can stay at the hotel (pub) or camp. Inland from Gladstone, Mackay and Rockhampton are Biloela, Rolleston, Springsure, Moranbah, Clermont, Dingo, Emerald, Anakie, Alpha, Jericho, Barcaldine, Blackall, Aramac, Muttaburra, Longreach, Winton, Kynuna, McKinlay and Boulia. Inland from Gladstone are Biloela, Rolleston and Springsure, and Carnarvon National Park. Biloela has not got much for travellers, but Springsure and Rolleston are small townships next to the Carnarvon National Park - one of the best national parks in Queensland. Places to stay include Best Western Hospitality Inn, Central Apartments Carnarvon and Carnarvon Gorge Wilderness Lodge. Inland from Mackay are Moranbah and Clermont. Moranbah is a small mining town, while Clermont has a museum as well as tours to the Blair Athol coal mine. Clermont is also famous as the town that moved - to the higher grounds after the 1916 flood that killed 65 people. There is a marker showing the flood water levels, and there is an old piano in a tree. Places to stay are hotels (pubs) and camping. Inland from Rockhampton are Dingo, Emerald, Anakie, Alpha, Jericho, Barcaldine, Longreach, Winton, Kynuna, McKinlay and Boulia. Dingo is a small town with nothing much for travellers, but the nearby Blackdown Tableland National Park is a nice place to visit if you like waterfalls and rock formations. Emerald is a centre of the surrounding farming country, and apart from a museum and botanical gardens there is a huge replica of the Van Gogh's painting Sunflowers in the town's central park. Places to stay include A & A Lodge Motel, Emerald Inn, Emerald Meteor Motel, Star Hotel and Emerald Maraboon Motor Inn. Rubyvale, Sapphire and Anakie are in the middle of some gemstone fossicking country. Further west are the small towns Alpha and Jericho, with some old pubs and colourful murals. You can stay at hotels (pubs) or camp. West of Jericho is Barcaldine, known as the “garden city of the west” thanks to the good supplies of the bore water which comes from the Great Artesian Basin, a huge underground water supply that extends to Gulf Savannah in north Queensland. It is also known as the centre of the historic Shearers’ Strike in 1891 which lead to the formation of Australian Workers’ Party (today’s Australian Labour Party). 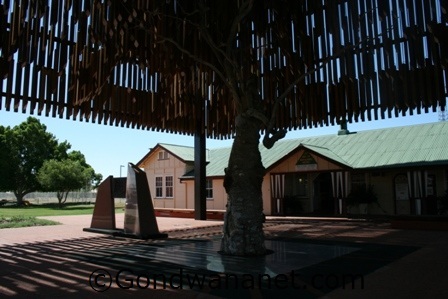 The organisers’ meeting place, a ghost gum near the train station, was called the Tree of Knowledge and became the symbol for workers’ rights. It was a healthy 200-years-old tree until in April 2006, someone poured poison on its roots and killed the tree. But that only made the tree even more famous. It’s still standing there, now in its own monument. You can learn more about the history of Australian workers’ at the Australian Workers Heritage Centre. Places to stay are hotels (pubs) and caravan parks. 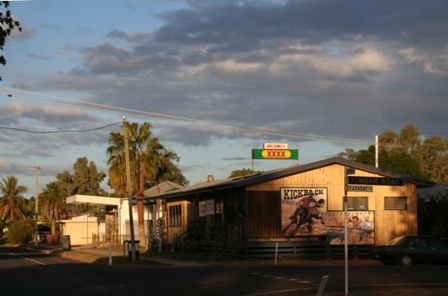 South of Barcaldine is Blackall - the town that is the site of the "Black Stump". It is also the site of the first artesian well that was drilled in Queensland, and also as the former home of Jackie Howe, who set the speed record in sheep shearing. He later run a pub in town, and is also buried here. There is the Black Stump Display, the Jackie Howe Statue, and the Blackall Woolscour that runs guided tours of an old shearing shed and a wool cleaner - still in working order and the only one of its kind left in Queensland. Places to stay are hotels (pubs) and caravan parks. North of Barcaldine are Aramac and Muttaburra. Aramac is a small outback town with a few old buildings, a pub and a statue of a bull in the main street, as well as the nearby Lake Dunn that is a nice place for camping. 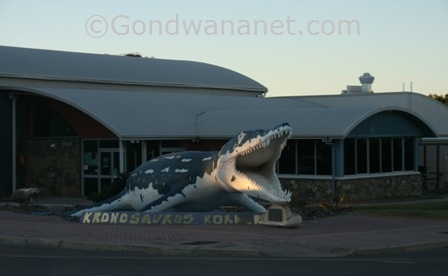 Muttaburra is another small town with nothing much for travellers except the statue of Muttaburrasaurus - the type of dinosaur whose fossils have been found in the area. Both towns have a hotel (pub) and a camping ground. West of Barcaldine is Ilfracombe, and further west is Longreach – the home of the famous Australian Stockman’s Hall of Fame & Outback Heritage Centre - one of the biggest tourist attractions in the outback Queensland. Longreach is also the original home town of Qantas Airlines and today there is a Qantas Museum that consists of an old hangar with historical stuff as well as a modern Qantas plane. Other things to see in town are the Powerhouse Museum, Longreach School of Distance Education, and quite a unique outback show in Banjo’s Outback Theatre. Longreach accommodation includes Longreach Motor Inn and Albert Park Motor Inn. The next town west is Winton – a cattle and sheep farming centre, mostly famous as the birth place of the song Waltzing Matilda. Banjo Patterson, one of the most famous Australian poets, wrote Waltzing Matilda after visiting Winton in the 1890s, and supposedly the song was first performed in the North Gregory Hotel in the main street. Today there is the Waltzing Matilda Centre, with both visual and audio displays about the song and its history. Other things in town are Arno's Wall, Musical Fence, some nice pubs, an old canvas theatre and some other nice old buildings, including an opal shop. There are hotels (pubs), motels and caravan parks in town. Winton is surrounded by red soils and opal country, and south of the town is a dirt road to Opalton. The town itself hardly exists, but the road is a nice outback experience if you like to get off the beaten track and go discovering. The track can be done in a loop, and along the track is the fossilised dinosaur stampede in Lark Quarry. Also south of Winton, along the track, is the entrance to Bladensburg National Park. West of Winton are the one pub towns Kynuna and McKinlay, and the Combo Waterhole, which is where the story in the Waltzing Matilda song took place. McKinlay is the home of the famous Walkabout Creek Hotel that was featured in Paul Hogan’s classic Australian movie Crocodile Dundee. Kynuna is the home of the Blue Heeler Hotel, named after a popular Australian dog breed. In front of it is a surf life saver's watch tower, used in the annual Surf Life Savings Carnivals (yep, the ocean is miles away and the carnival does exist :-). In both Kynuna and McKinlay you can stay at the camp ground behind the pub. Both townships have a hotel (pub) and a camping ground. Further west is Boulia, a town that is known for Min Min Lights. So, the town's big drawcard is the Min Min encounter, where you can discover the lights and learn the stories behind them. Another thing in town is the Boulia Stone House Museum, in a building from 1888. Places to stay include a hotel (pub), a motel and a caravan park. Inland from Townsville are Ravenswood, Charters Towers, Hughenden, Richmond, Julia Creek, Cloncurry, Mount Isa and Camooweal. And inland from Bowen are Collinsville and Bowen River Hotel. 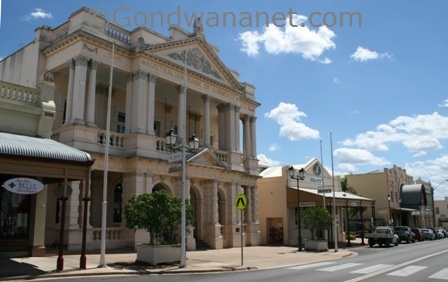 Inland from Townsville are Charters Towers and Ravenswood - both are historical as well as modern mining towns. Ravenswood is almost a ghost town, with two pubs and some other historical buildings, old mining ruins and relics, as well as a working mine. If you like mining history, it's a great little town to discover. Places to stay are pubs and camping grounds (behind Ravenswood is also the Burdekin Falls Dam and Lake Dalrymple). Charters Towers was always bigger, and still is. It has got some fantastic old buildings that really remind you of the town's former wealth. There are the World Theatre, the Civic Club and the old Bank Building, as well as the old international Stock Exchange Arcade, built in 1888 – one of Australia’s oldest. More about the town's history can be learned in Venus Gold Battery, The Old Miner's Cottage, Zara Clark Museum, and from the displays and the free nightly movie at the town's Lookout Point, which has great views over the town that once was the second largest city in Queensland with 25 pubs only in the main street and nearly 100 mines around it. Some of the places to stay include Best Western Country Road Motel, the Park Restaurant & Motel, Dalrymple Tourist Van Park Hotel and Royal Private Hotel. West of Charters Towers are Balfes Creek, Homestead, Pentland, White Mountains National Park, Torrens Creek, Prairie, Hughenden and Richmond. Hughenden and Richmond are centres of the surrounding cattle and sheep country, which, for tourists, are mostly known as two of the three towns in the so called "Winton - Richmond - Hughenden Dinosaur Triangle". 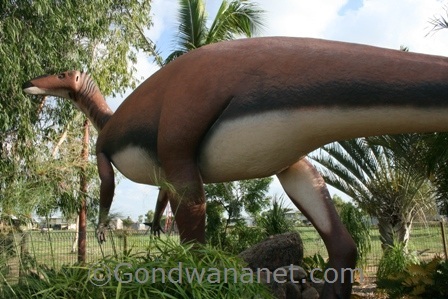 In Hughenden, there is the Dinosaur Display and Museum, with a lot of dinosaur fossils, and one whole big skeleton. Some of the places to stay include the Grand Hotel, Royal Hotel-motel, or Allan Terry Caravan Park. In Richmond, there is the Kronosaurus Korner with more dinosaur fossils. Places to stay include Richmond Caravan Park, Aminite Inn and Federal Palace Hotel. Further west are Julia Creek and Cloncurry. Both are small pastoral centres with some mining history. 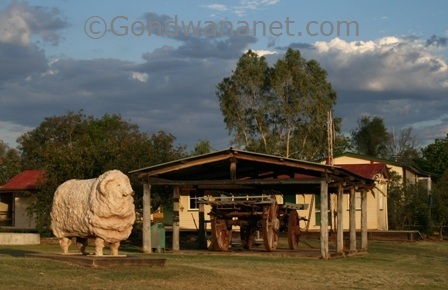 Julia Creek has not much for travellers except a few old pubs and a museum in the main street. Places to stay include Julia Creek Hotel and a caravan park. Cloncurry is the birthplace of Royal Flying Doctors Service. There is the John Flynn Place with displays about the history of Royal Flying Doctors Service, and the Mary Kathleen Museum - with some memorabilia, minerals and relics from the old mining days. Places to stay include Central Hotel, Wagon Wheel Motel, Gidgee Inn and Gilbert Park Tourist Park. West of Cloncurry are Mount Isa and Camooweal. Mount Isa is the home of one of the largest underground mines in the world. You can visit the mines on a tour, which is very interesting. It was also a town that was prepared for bombings during the WWII, so there is an undergroud hospital, and nowadays also an underground museum. The tourist information centre is at Outback at Isa, which houses displays of the town's history and the Riversleigh Fossil Centre where you can watch scientists at work with fossils. Next door is the Kalkadoon Centre with information about and art by the local Aboriginal People. The town's lookout has great views over the town and the mine. North of the town is Lake Moondarra, and west is Camooweal - a small country town with a few historical buildings and an old pub. Places to stay include All Seasons Verona Hotel, Agryilla Tourist Park Big 4, Central Point Motel, Copper City Motel and Caravan Park, Fourth Ave Motor Inn, Outback Mt Isa and Townview Motel. Here's a map of outback Queensland, where I have tagged the places that I mentioned on this web page. You can click on the tags to see what places they are, and double-click anywhere on the map to zoom it in and see the places closer. Drag the map to move around, and if you want to see the satellite image with Google Earth, click on "Sat" in the top right hand corner. Did You Go to Outback Queensland or Live there? Did you go to outback Queensland? We all love to read about other people's stories and other travellers' experiences - good or bad! Tell us where you went and what you enjoyed.